We are finally going to get some snow here in NY. Well at least in these parts of NY. We literally never get snow like ever. It always misses us. So far we have got just some slush. Honestly I'm ok with that. My floors in my house not so much. I've been an clean freak nut with a steam cleaner. home with the kiddies. Nothing is better than that! My munchkin and I will most like get to baking some Valentine day treats. The big game is steadily approaching! I just love making game day treats. However I do not like the calories that come along with them. These nachos will surely knock your socks off! Like totally. If you are a cheese lover then these are for you. Taco meat smothered in spicy chili cheese sauce is a match made in heaven. We make nachos in our house quite a bit. They are the easiest thing to make especially for a crowd. You could easily double this recipe also. If you are watching your calories lighten up your tortilla chips, your meat option by using ground turkey, and lower fat cheeses and sour cream! For the taco meat, add 1/2 teaspoon olive oil to a skillet. Add onions, and saute for 3 minutes. Add beef and seasoning, and brown and crumble meat until cooked through. Drain all of the fat very well. Melt the butter in a saucepan over medium heat. Sprinkle the flour over the top, stirring constantly until a thick paste forms, 1 to 2 minutes. Slowly add the milk to the flour and butter roux in a steady stream, whisking constantly. Continue cooking, whisking constantly until the mixture thickens, about 5 minutes. You will have a basic white sauce at this point. Add the cheese, whisking constantly until it is melted. Add the sriracha sauce, chili powder and cayenne pepper. Taste, then add salt and pepper to taste. Add more cayenne and or sriracha sauce if you want it more spicy. Keep on low stirring occasionally heat until ready to use. Turn your oven broiler on low. Lay out your tortilla chips in a large rimmed baking sheet lined with parchment paper. Spoon the taco meat all around the chips. Next pour the cheese sauce all over the chips and beef. Now add the rest of your grated cheddar cheese. Broil for 5 minutes or until cheese is melted. Top with the rest of your toppings. Enjoy! 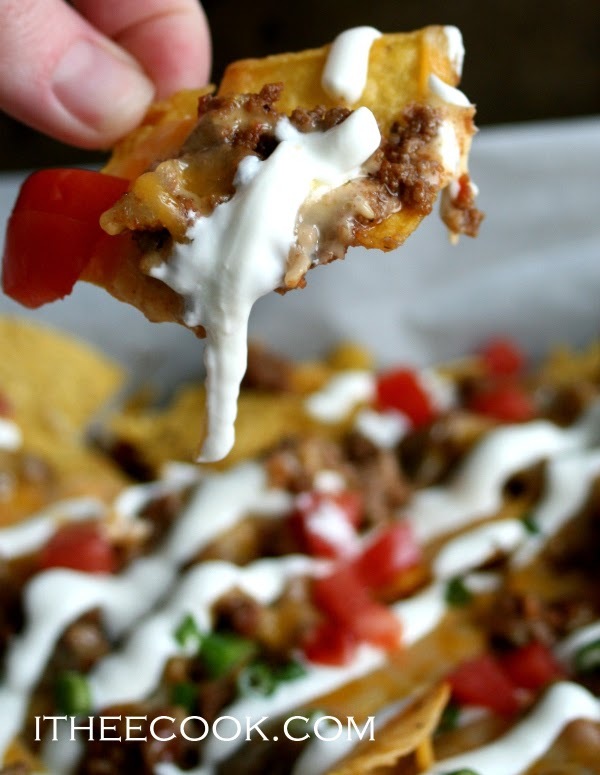 I want to make nachos for the game on Sunday and your spicy chili cheese sauce sounds perfect. My family loves Sriracha. I hope you like them Jenn! 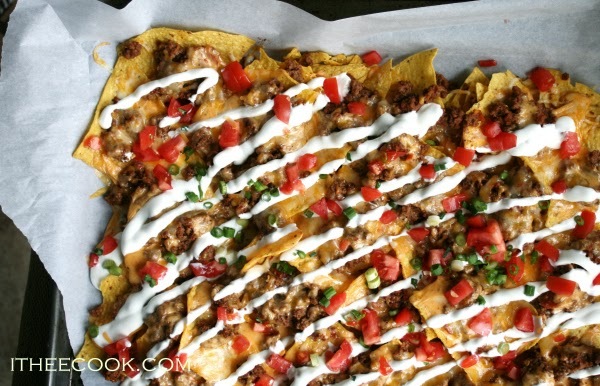 These might just be the most perfect SuperBowl nachos I've seen so far, they're a work of art! This looks so delicious and perfect for this Superbowl Sunday to start with! Yum! These nachos look so good!! And I really like he sound of your spicy chili cheese sauce. I just love your Beef Nachos, the flavors are wonderful! Thanks so much for sharing your post with Full Plate Thursday. Hope you are having a great week and come back to see us real soon! Hi Rina! We love our nachos and yours looks beautiful. I'm featuring this at tomorrow's Thriving on Thursday linky party. It was such a pleasure to have you. Hope to see you again soon.